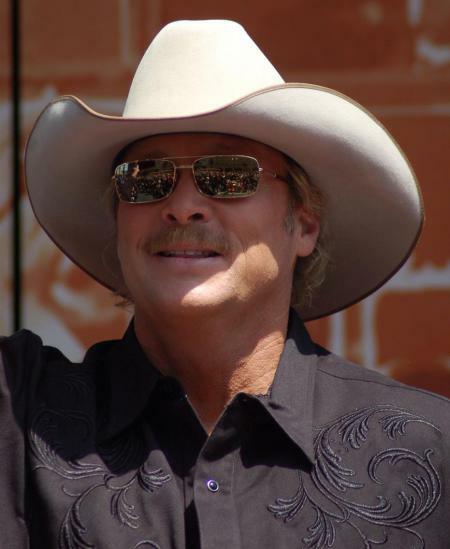 Alan Jackson Net Worth 2018: Hidden Facts You Need To Know! 1 Inducted into the Georgia Music Hall of Fame in Atlanta, Georgia on October 22, 2001. 2 He was awarded a Star on the Hollywood Walk of Fame for Recording at 6801 Hollywood Boulevard in Hollywood, California on April 16, 2010. 3 His song "Midnight in Montgomery" tells the story about the singer's encounter with the ghost of Hank Williams, who was waiting for him on New Year's Eve, which was the night in 1952 when Hank died. 4 Often regarded by critics and industry experts as among the few country performers to embrace the traditional sound over the more pop-sounding form that gained popularity in the 1990s. 5 Used Mike O'Malley and Anthony Clark from his favorite television series Yes, Dear (2000) in his music video "The Talkin' Song Repair Blues". 6 Has three daughters: Mattie Denise (born July 19, 1990), Alexandra Jane (born August 23, 1993) and Dani Grace (born August 28, 1997). 7 Parents are Joseph Eugene and Ruth Musick Jackson; has four older sisters. 1 I've had several working-man songs that I like. 2 I mean, my girls are very sweet; I'm very proud of all of of them. 3 He's written some great songs. I thought that "Blues Man" was a perfect song for me to do as a tribute. 4 I always try to make the music that I like and think my fans will like. 5 As long as I'm still able to have a hit on the radio and sell a few albums and some tickets, I don't see that it would be worth retiring. 6 I really was a fan of his and always have been - his writing especially, you know? I think people a lot of times overlook that part, because he kind of got into that party character so heavy. 7 I don't write all my stuff. Everybody always thinks that. But in just about every album I've ever had has been about 50-50 songs I've written or co-written and other people's songs. 8 I've been a lot of places, and my wife, Denise, she likes a lot of the fancy restaurants. I'm more of a basic eater. I still go into Cracker Barrel. Those are the kind of people who like the kind of music I'm making. 9 I could have done a hundred songs, really. It was hard to narrow them down, because I tried to pick songs for the most part that actually did have some effect on me or influenced me in the past. 10 I think I've always approached making albums pretty much the same way. I'm just looking for a mixture of songs and topics that aren't the same thing over and over. 11 My mother kept asking me, "When are you going to do a gospel album?" And I've always wanted to do a gospel album. Everybody was going on about it, so mom started hounding me more. 12 The fan base that I've had all these years has come along. Some of them are not as plugged into the digital world, so they want to go out and buy the CD at Walmart or something. 13 Probably some of the songs I never even really listened to the lyrics. Half of them I'd hear off the radio and was probably singing the wrong words and didn't even know it. 14 You think a lot of people get to be big stars and get a little crazy, but most of the ones I've ever met have always been surprisingly normal, and I've enjoyed that. 15 A lot of times when songwriters get together and write a song... somebody will come in with a hook and a lot of times they come out with something that sounds a little crafty. 16 I've had to live with women all my life. I grew up with four older sisters, and I was the baby and the only boy. 17 If you just do 50 to 60 shows a year, it's not that much time away from home. 18 "After 17" is a song I wrote when my first daughter went to college, so that's kind of where I'm at in that part of my life. If you listen to that song and knew anything about me, you'd say, "Oh yeah, he wrote that about his daughter," but I try not to write them that they are so specific that they wouldn't apply to anybody that has a child. 19 It's a scary word, 'cancer'. 20 I didn't realize until I was older what a huge music fan my daddy really was, and actually that my grandma played banjo at one time, and I didn't even know that until a year or two ago. 21 I've always said that if you have songs on the radio and get played, you've got to have a tour to support that. 22 When I was in high school, I don't know that I really had big dreams. 23 I mean, my voice has gotten a little deeper sounding as I've gotten older, I think. I noticed that. 24 I've always stood up for country music. 25 If you can last until you're 40 years old, hopefully you'll be mature enough to figure out the rest of the years. 26 You just write about things that happen. 27 Oklahoma's always been good to me. 28 The music business doesn't take up that much of my time. I probably should put a little more energy into it. 29 Making music is still what keeps a fire going on in me. 30 I've always wanted to make a bluegrass album. 31 The older you are, I think you realize what you enjoy and what you don't need, what wears you out and what's important. 32 I think every album you have, especially if it's done well, you feel like you're competing with yourself. 33 You have to be tough-skinned and willing to accept criticism, and at the same time, just try to do music that you like and you are proud of and not just whatever you think it's going to take to get you on the radio. 34 Hee Haw was probably my biggest exposure to live music at a young age, because there wasn't any live music around my town and no one in my family played instruments. 35 Growing up in Georgia, I used to think people up north or out west were so different. They're really not. They're just regular people who live in small towns. They grow up and try to raise families and have a job and go to church and play softball. It's that way everywhere. 36 I grew up with nothing, so whenever I got to where I could have something I felt like I needed to have everything I couldn't have when I was young. 37 I think if you retire from touring, then people think you are retired. 38 For some reason, I've been labeled that and it's fine, but there are a lot of other artists that sing real traditional stuff, so I don't know why they picked me. That's what I've always done. 39 What I enjoy doing more than anything is, I have my little antique car collection, and when the weather is pretty I like to get out one of my old cars. I have a little route I run down in the country, down Nachez Trace Parkway. The loop down through there is just really relaxing, not much traffic. 40 If anything good came out of 9/11, to me, was that people were so cynical about the world - all you hear about on the news is all the bad stuff everyday, but what was refreshing to me was after that, you saw how many good people there are out there. For every one bad one, there's a thousand good ones. 41 I mean, I am driven and laid-back at the same time. 42 A country song is a song about life. 43 I'm usually just enjoying life. 44 I like to write sad songs. They're much easier to write and you get a lot more emotion into them. But people don't want to hear them as much. And radio definitely doesn't; they want that positive, uptempo thing. 2010 Star on the Walk of Fame Walk of Fame Recording On 16 April 2010. At 6801 Hollywood Blvd. 2008 Grammy Grammy Awards Best Country Vocal Performance - Female For the song "A Woman's Love." 2007 Grammy Grammy Awards Best Country Album For the album "Like A Red On A Rose." 2003 Grammy Grammy Awards Song of the Year For the song "Where Were You (When the World Stopped Turning)." 2003 Grammy Grammy Awards Best Country Album For the album "Drive." Home Alone 2: Lost in New York 1992 performer: "A Holly Jolly Christmas"
24th Annual Country Music Association Awards 1990 TV Special performer: "Here in the Real World" / writer: "Put Yourself in My Shoes", "Here in the Real World"
A Million Ways to Die in the West 2014 performer: "A Million Ways To Die"
I Am Number Four 2011 "As She's Walking Away"
CMT: 40 Greatest Love Songs 2011 TV Movie performer: "Remember When" / writer: "Remember When"
Unstoppable 2010 performer: "COUNTRY BOY" / writer: "COUNTRY BOY"
Best of CMT Music Awards 2009 TV Special performer: "Good Times"
W. 2008/I performer: "Chattahoochee" / writer: "Chattahoochee"
Billy: The Early Years 2008 performer: "Look at Me" / writer: "Ruth's Prayer"
National Treasure: Book of Secrets 2007 writer: "Better Class of Losers"
CMT Presents: Karaoke Revolution Country 2006 Video Game "Chattahoochee"
AMV Hell 3: The Motion Picture 2005 performer: "Pop a Top"
Jimmy Buffett: Mini Matinee #1 2003 Video documentary short performer: "It's 5 O'Clock Somewhere"